The owners of a north-end grocery store are sharing more details about their plan to convert a long-vacant downtown Port Huron into a new grocery store. 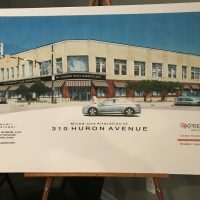 Steve Fernandez and Michelle Jones recently unveiled the floor plans for the former Woolworth’s building in Downtown Port Huron, which is in the process of undergoing $2 million worth of renovations. Fernandez says they have already encountered a few changes in plans. “Our original thought was to put a storage facility (in the basement)… we’ve come to the realization that we need the storage space for the grocery store itself,” said Fernandez, in an interview with WPHM. The main floor of the building at the corner of Huron and Grand River avenues would be a grocery store with office and loft space on the top floor. He also says he has been in discussions with the city to help alleviate some concerns about parking. Fernandez hopes to have a block of parking spaces near the building reserved for customers to load groceries into their cars. “When people get their groceries, we’ll have folks that will take the groceries out to their car.” Fernandez says demolition crews have already removed much of the building’s metal facade, exposing the original brick structure underneath. The building is expected to become the new home of Country Style Market Place and could open later this year.